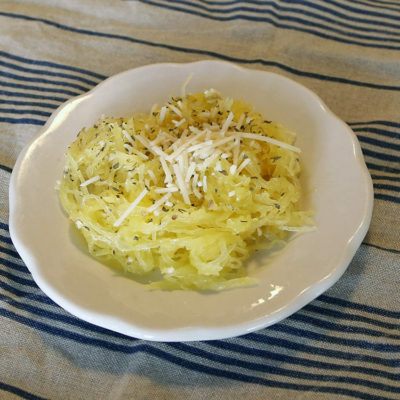 Using a large sharpened knife and cutting board, carefully split the spaghetti squash in half, lengthwise (If you are having a hard time splitting it, poke slits with knife and microwave 5 minutes first.) and scrape out the seeds. Drizzle 2 tsp. olive oil over spaghetti squash and place face down on an aluminum lined baking sheet. Roast 30-40 minutes until soft. Remove from the oven and let rest until cool enough to handle. Use a fork to scrape the strands of squash from the inside of the skin into a dish or container. Drizzle with the rest of the olive oil, salt, pepper, dried oregano, and parmesan. Toss to combine.